In this digital age, you’ll likely see a lot of amateur photographers capturing the next snap for their Instagram when you go to any events, particularly concerts. Between sports games, concerts and conventions, stadiums are the best place to be. Millions of pictures are uploaded to Instagram everyday, and the platform is quickly starting to give us an insight into someof the world's most visited cities. We've looked at the number of hashtag mentions of each of the world's capital cities to determine which gets the most love on Instagram - and it might not be the places you expect! NYC; home to some of the world’s most famous neighborhoods as well as some of the world’s most famous tourist attractions! But; which comes out as the most instagrammed? When it comes to choosing which airline is best for your journey, many of us simply look at the price itself and opt for the cheapest option. However, one of the most important things to check is how comfortable you’re going to be once you’re in the air, especially if your flight is going to be lasting several hours. Technology is constantly changing every aspect of our day to day lives, including how we travel the world, where we stay, and the things we do on our travels. For example, nowadays we can have our boarding passes sent straight to our phones, and instead of booking a hotel through a travel agent, many holidaymakers are now using apps to skip the middleman and rent a room with a local! If you have caught the travel bug, you may be wondering where to tick off your bucket list on your next trip away. However, if you visit somewhere special and really fall in love with the place, it can be tempting to simply head back to the same destination time and time again! Jetting off on your dream holiday is something we all look forward to, but the flight itself is certainly something that you either love or hate. Unless you’re one of the lucky ones who can doze off just about anywhere, you may struggle to get any shut-eye while in the air. 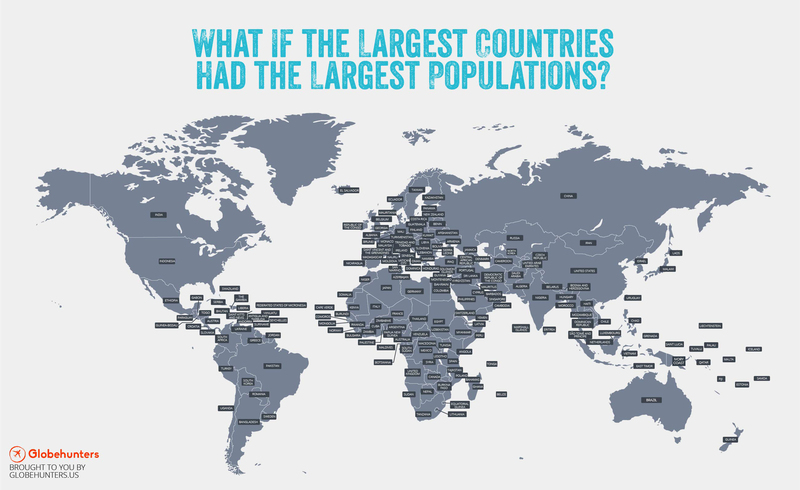 We wondered…if the largest countries (in terms of landmass) had the largest populations, what would the world map look like Click the map below to open a larger version… Don't forget to check out our deals on cheap flights here at Globehunters, or get in touch with one of our travel consultants who will help you with your travel needs. When you’re off travelling the world, chances are that you stick out like a sore thumb, that’s just the way it is. But lots of travellers really don’t help themselves, putting their foot in it by coming out with insensitive or embarrassing things, usually completely unintentionally. It’s common knowledge that everything in the US is bigger than here in the UK whether it be the food, the cars or the houses. But what puts it into perspective is when you see that entire states are actually multiple times bigger than our humble little island!